CNUSail 1 (Chungnam National University Sail) is a 3-Unit CubeSat from South Korea tasked with the demonstration of a large sail for use as a solar sail and as a deorbiting device for small satellite missions to tackle the growing space debris problem. Also known as Papillon, the satellite will test out its sail design for use as a solar sail for potential application as a passive propulsion device in high orbit missions and demonstrate its use as a drag sail for rapid deorbitation of low orbiting satellites. 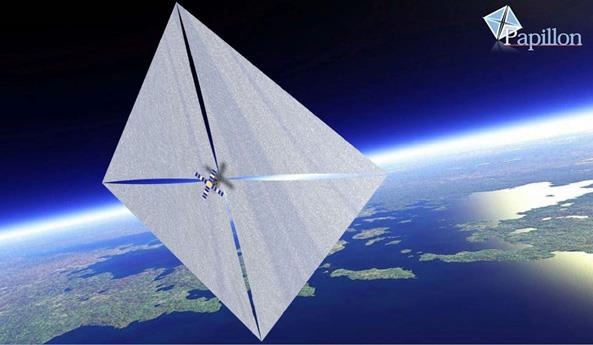 Solar sails use Solar Radiation Pressure as a means of propulsion by deploying a very large sail area to exploit the fact that photons, although by definition massless, possess an impulse which can be used to generate a minute thrust component when interacting with the solar sail. This is of particular use to missions in high orbits around Earth or those traversing deep space as a considerable change in velocity, even with very large sails, can only be achieved over long periods of time. Drag sails on the other hand are used to slow a satellite down by means of interaction with particles in the upper atmosphere to accelerate a satellite’s orbital decay and bring it to a timely disposal after the end of its useful mission. More and more projects have looked into drag sail technology to advance its readiness level to become an operational component of small satellite missions. CNUSail 1 is a 10 x 10 x 30-centimeter, 4.0-Kilogram triple-unit CubeSat that aims to deploy a 2 x 2-meter solar sail and demonstrate stable three-axis pointing of the sail by means of reaction wheels and magnetic torquers to actively modify the drag experienced by the satellite. 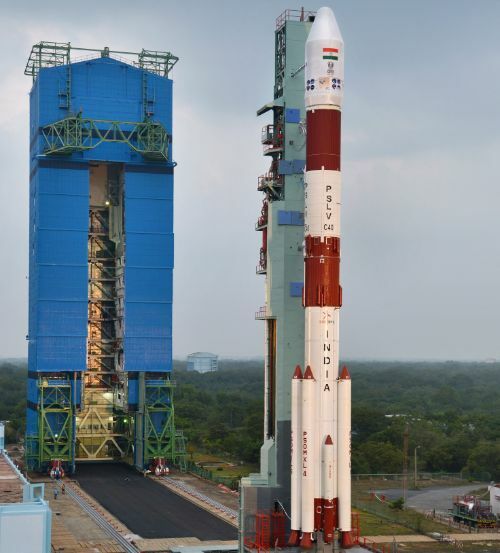 The primary objective of the mission is developing an attitude control system adequate for CubeSat missions with large sails that desire to move them between nadir- and velocity vector-pointed modes for minimizing and maximizing aerodynamic drag. 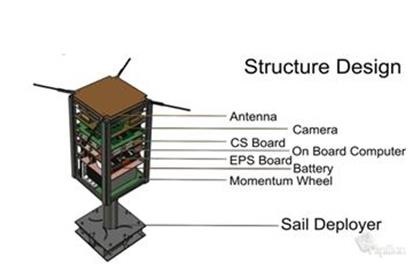 The CNUSail 1 satellite comprises two principal elements – the satellite bus taking up 1.5 CubeSat units and the sail deployment system and two documentation camera reside in the remaining 1.5 U. The deployment system is divided into two parts: the boom storage and deployment mechanism and the membrane storage holding the four triangular membrane segments in a volume of 0.5 U and the four booms also in 0.5 U. The sail membranes themselves consist of an ultra-thin Kapton sheet only 0.25 micrometers in thickness, supported by C-shaped steel booms with a 0.2-millimeter wall thickness sufficient to support themselves and the sail. Each boom is 1.42 meters long and deployment is accomplished by means of stored energy within the booms. 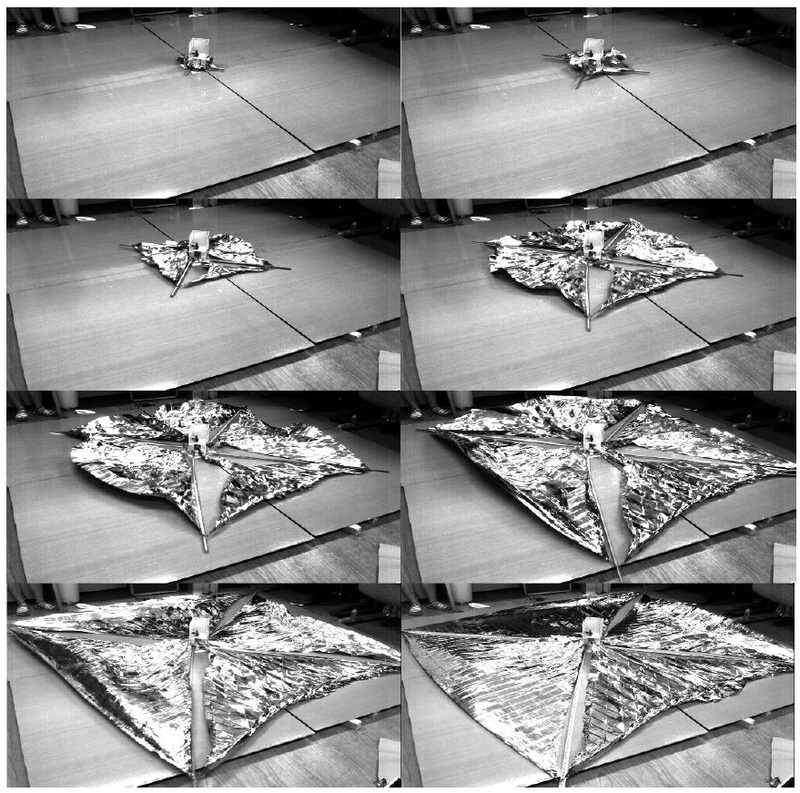 Three different mission phases have been outlined for the satellite: 1) deploying the solar sail and demonstrating prolonged operation in Low Earth Orbit; 2) maneuvering the satellite across large angles to test the limits of the control system and 3) place the satellite in a high-drag attitude for a speedy orbital decay. The other focus of the CNUSail mission, aside from sail deployment, will be on the satellite’s attitude control system. Attitude determination is provided with an accuracy of 3° by a three-axis magnetometer, a MEMS Gyro and sun sensors while actuation is accomplished with a reaction wheel system and three magnetic torquers (two torque rod and one air coil) that deliver a pointing accuracy of 5° and a pointing stability of 0.1°/s.